I’m a Cornhusker by birth (Go Big Red! ), but I’ve lived in Virginia almost my entire life, so I’m allowed to say y’all. That said, I live in the exurbs of Northern Virginia . . . so I have to use it sparingly. My daughter and I are having Girls Night (our boys are away doing boy things). I told her I’d make anything she wanted for dinner. Her choice? Fried Okra. Atta girl!! Fried Okra is one of the best foods the South has to offer. I love almost all southern food. With the exception of pork rinds (ghastly) and boiled peanuts. My Georgia girlfriend says it’s pronounced, bald peenits. Right, then. Bald Peenits are gross. Peanuts aren’t supposed to squish when you eat them. And don’t tell me I haven’t tried the “right” boiled peanuts. I’ve given them more than a fair shake, trying them several times, even from a guy on the side of the road in South Carolina. Bald Peenits are gross. But I digress. Fried Okra is another über-polarizing food — you either love it or you hate it. And I love it . . . in all its fried slime glory. When I was pregnant with my daughter, it’s all I ate — and my daughter has always loved fried okra. Coincidence?? Fried Okra is über-simple to make. It’s one of my no-recipe recipes. 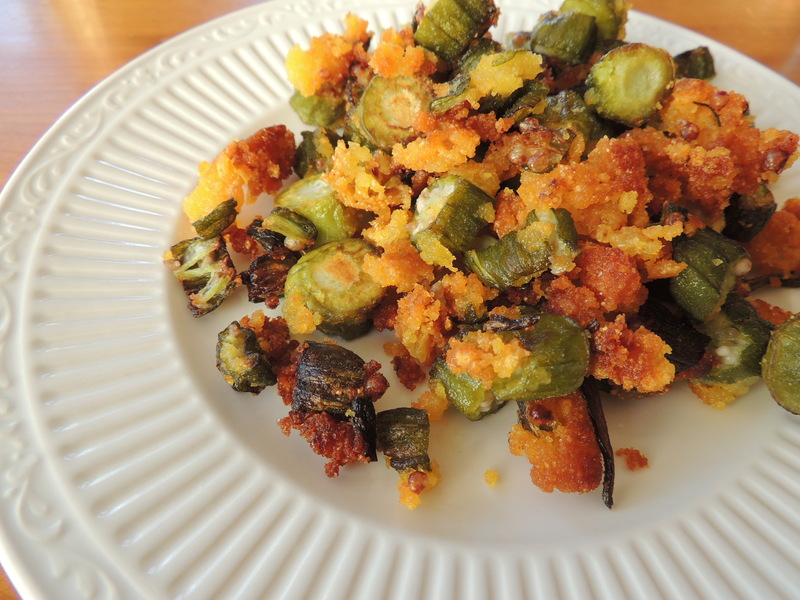 But I found a recipe online that’s super easy and super similar to what I make: Fried Okra. All you need is okra (I use frozen when I can’t get my hands on fresh and it’s just as delicious), egg, cornmeal, vegetable or canola oil and salt. Lots of salt. You’ll notice I pan fry my okra. I’ve made it in “nugget” form in my deep fryer, but man-alive does that make a mess. Have you ever cleaned corn meal out of a deep fryer before? If you have, you know why I pan fry the okra. And what to pair with our Fried Okra? Anytime I see the word fried, my wine pairing brain goes straight to Bubbles . . . do not pass GO, do not collect $200. Bubbles. Tonight, I selected Gruet Blanc de Noirs. Mostly because that was the only bottle of bubbles in my wine fridge. And yes, my daughter has her own mini-Champagne glass (it’s a cordial glass). Because I’m that mom. 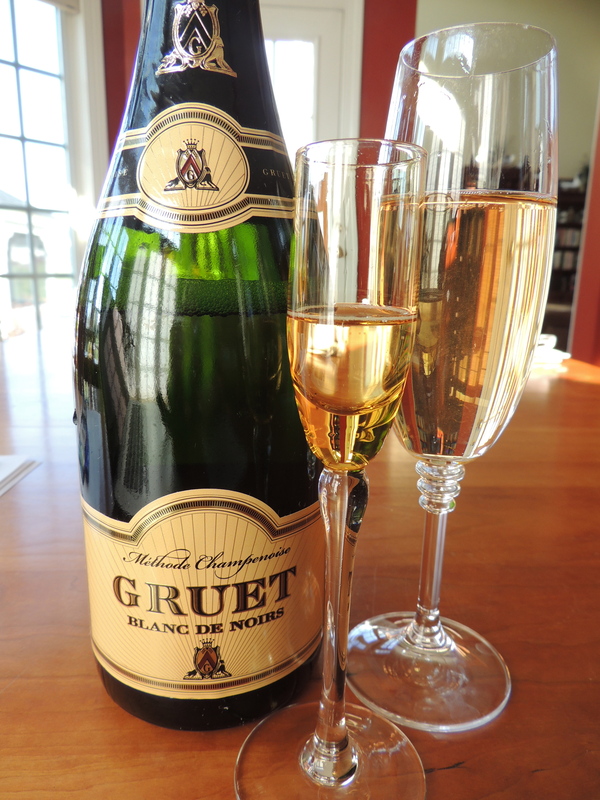 The Gruet is a terrific bottle of budget Bubbles . . . I’m a repeat customer. Crisp and lively, with flavors of vanilla, apple and pear. All for $13 bucks. No complaints here! I love this pairing . . . is there any fried food Bubbles can’t make better? I just can’t do okra, not even deep-fried. But that just means there’s more for you. 🙂 And LOL at bald peenits. I’ll pass on those too. Ooooh, goodie . . . more okra for me! 😃 Glad I have some company on the no love for bald peenits! Salud!! Interesting about the okra. We don’t have it often. It’s more of a novelty when we are traveling. We can get it however and I think I’ll try some as you suggest – fried. On the Huskers. I’ve only been to two NCAA football games and one was in Lincoln where the Huskers battled Penn State. Pretty awesome to see how the people of Ljncoln and Omaha get crazy. Good friends lived in Omaha for a number of years and returned home with a life size black Labrador dog statue that they called Big Red (it did have a red ribbon around its neck, I guess). I’ve always cheered for the Huskers ever since. Funny the allegiances we form on the flimsiest of circumstances. You got to see a Nebraska game IN Lincoln?!? Lucky you!! Those are NOT easy tickets to come by!! Love the Big Red dog statue!! And always glad to have some BIG RED fan company!! Let me know if you try the fried okra! Salud!! I love fried okra! It isn’t often served at restaurants here in the NW, so I might have to try making it myself. And bubbles with fried food is great – I’ll have to check out the Gruet. Thanks! Isn’t it the best?!? I hear you . . . when we lived in Monterey, I had serious southern food withdrawal. But the NW has some pretty terrific food of its own . . . hello salmon and crab!! Do let me know what you think of the Gruet. Salud!! You could replace fries with fried okra and that would be ok with me (I live in Charleston, SC, no wonder.) Just be careful that the okra is cleaned properly because if you get a piece of the woody end that isn’t soft, eating it is very unpleasant as you could imagine. Thanks for stopping by, Thomas! I LOVE Charleston . . . it’s one of my favorite cities on the planet!! And I’m with you on the woody okra . . . can’t stand it when you get a tough piece! If I have fresh okra, I’m sure to only pick the small, tender pods. The big ones are TOUGH! Salud!! I’m a southern boy. Fried okra was my favorite vegetable when I was a kid (if it still counts as a veggie with the breading and oil – lol). I still love it, but my veggie horizons have expanded as an adult. Never thought about pairing a bubbly wine with it, though. Willing to give that a try! Thanks for the post. Fan of Gruet. Do you thaw the frozen okra before soaking in egg? If you thaw the okra, the egg sticks better, but honestly, I usually don’t . . . and it turns out just as well. Salud! My female offspring and that i square measure having women Night (our boys square measure away doing boy things). I told her I’d create something she needed for dinner. Her choice? cooked Okra. Atta girl!! cooked Okra is one in all the simplest foods the South has got to supply. Yep! Simplest . . . and best! Salud! !